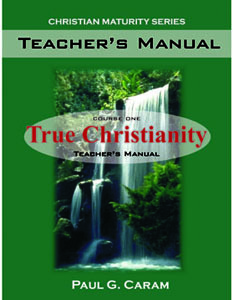 This teacher manual is based on Dr. Paul Caram’s book True Christianity. Dr. Caram’s excellent and life changing study on the topic of True Christianity is a focus upon the most important subjects of life. Our Lord's discourses concentrated solely upon the most critical issues of the heart and that is what every true believer should do as well. Dr. Caram has searched the Scriptures in order to find the themes that will determine our eternal destiny so that we might obtain the full inheritance that God has in store for us.